It is a special delight whenever Jeff Lemire debuts a creator-owned work. Trillium was a time-bending love story of exceptional depth and vision. Underwater Welder was hauntingly beautiful storytelling. 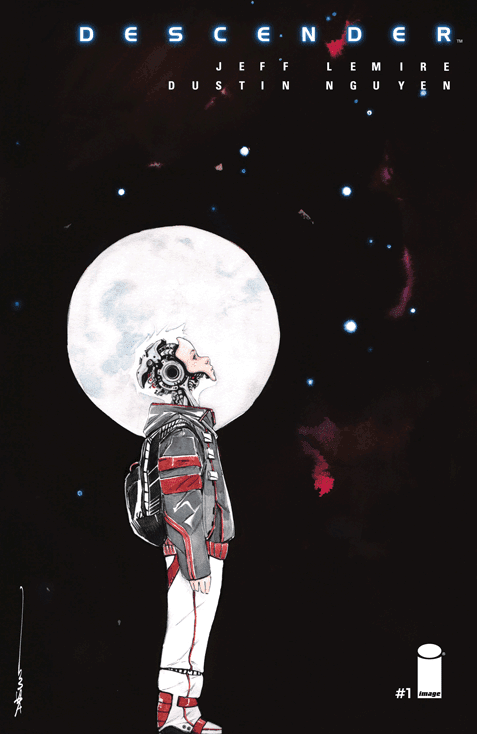 Descender #1 with Dustin Nguyen providing the wonderful pencil and watercolor work is yet another transcendent saga that whisks the reader away into a journey of unequaled emotional gravity and awe-inspiring world building. Welcome to the planet Niyrata, the technological and cultural hub of the nine planets that make up the United Galatic Council. It's a wondrous place so advanced that artificial intelligence and robotics is commonplace. It's also partially responsible for it what happens next. When nine gigantic robots or Harvesters as they are called attack the colony it forever alters the lives of the remaining survivors. Those same robots they so heavily relied on have been outlawed to prevent an escalation of artificial intelligence going rogue ever again. An unknowing link to those murderous machines rests in a outlying mining colony who has just awakened- Tim 21 and his "dog" Bandit. A sole survivor himself, Tim the android boy is instantly endearing as he searches for his "mom" and "Andy." His reunion with his pet is relatable and Lemire knows how to tug at the heartstrings. In fact, Lemire is a master of evoking emotion and empathy from his characters. How long will Tim survive with bounty hunters and others in pursuit? Nguyen perfectly compliments the story with an ethereal stroke of color and shadow from the day of destruction to the Dirishu-6 moon where Tim resides. The transitions of light from the horizon to space are especially effective as the spectrum goes from pastel blues to pastel reds then the black of space. The environs of Dirishu are washed in a moonglow of grayish-blue hues that darken and lighten as Tim roams the grounds. It's as though you're walking among the clouds of someone's dreams. A stunning work of art that evokes as much feeling as Lemire's words if not more. In one issue, you have the work of two masters that are fully engaged in bringing this epic space opera to life. It's full of wonder, danger, unease, and intrigue. Start collecting Descender now. It will be the talk of the industry right down to award season. This is one story to be cherished and enjoyed and it's just beginning. Easily the pick of the week.